Not every city has bulls standing placidly on the street. 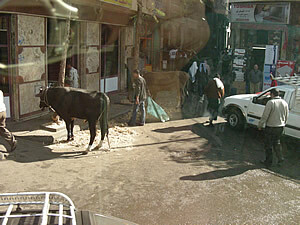 As we drove through Cairo in a taxi a day after Christmas, we saw this steer being cared for by several young boys. He would be killed in a few days and given to the poor during a Muslim festival in which charity was a feature.I wish I knew more about it to write with more authority, but I include this picture here because it seemed as out of place as finding a bull would be in Los Angeles. Yet on second thought it was not so amazing when I think of all the other sights that seemed so foreign to our experience. What have you seen in your travels that is most out of place? How does that add flavor to your life?